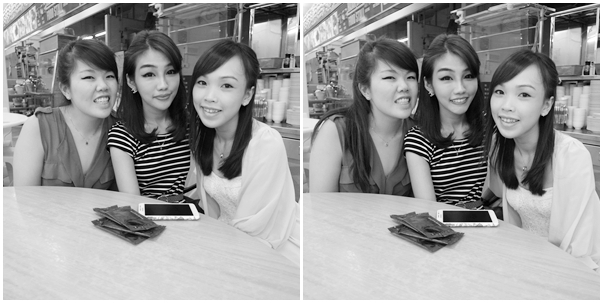 We decided to meet up for dinner after Ali's Prelims and Daryl suggested Uncle Leong Seafood. They've got 2 outlets, one at Punggol and the other at Braddel Tech Building. We went to the latter since its more convenient. because Daryl says the Punggol outlet is usually packed. We ordered 2 crabs, 1 veg and a "hor fun" for sharing. This picture does not do any justice to it, I got addicted to the sauce after my first taste. It is creamy with a slight peppery taste, topped with cereal for the extra crunch. Crab was so fresh its meat doesn't stick to the shell at all. This is my first Crab Bee Hoon Soup ever. I love everything about it except that it was a little too oily. Our total bill came up to about $120 so it was about $30 per person after the breakdown. Pretty value for money since we had 2 crabs!